Sri Lanka’s politics is in a state of turmoil following the Local government Authorities (LGA) elections held island-wide on February 10, 2018. The last election to Local Authorities was held in 2011 on a staggered basis. Nominations were called for 93 local authorities (7 MC, 18 UC, 68 DC) 11 and 14 December 2017. A total of 523 nominations (466 form registered political parties, 57 from independent groups) were received of which 500 were accepted (447 form registered political parties, 53 from independent groups) and 23 rejected (19 form registered political parties, 4 from independent groups). The total number of members in local government has been increased from 4,486 to around 8,356 members. According to Section 27F of the Amendment, 25 percent of the total number of members in each local authority has to be women. This does not mean that 25 percent of the elected members of every party must be women. This is an overall percentage for the LG body. Elections have to be held for Local Government Authorities (LGA) on same day. Nominations to the remaining 248 local authorities (17 MC, 23 UC, and 208 DC) took place between 18 and 21 December 2017. A total of 1,582 nominations (1,399 form registered political parties, 183 from independent groups) were received of which 1,553 were accepted (1,379 form registered political parties, 174 from independent groups) and 29 rejected (20 form registered political parties, 9 from independent groups). On 18 December 2017 the Election Commission announced that elections to all 341 local authorities would be held on 10 February 2018. Around 13,000 polling stations were used. The election will cost around Rs. 4 billion and needed 300,000 staff, including 65.000 Police personnel. On 30 January 2018 the Supreme Court issued an injunction preventing election in Elpitiya DC following a petition by the Democratic United National Front against the rejection of their nomination list. The elections held for 340 Local Authorities have resulted in over 180 LGAs having hung councils with no party winning a clear majority. This is largely due to the change in electing members under Proportional Representation (PR) to the new Mixed Electoral System (MES). The Sri Lanka Podujana Peramuna (SLPP) was able to secure victory in 239 Local Governments, followed by the United National Party (UNP) with 41, Tamil National Alliance with 34 and the United People’s Freedom Alliance (UPFA) and the Sri Lanka Freedom Party (SLFP) jointly securing 10. 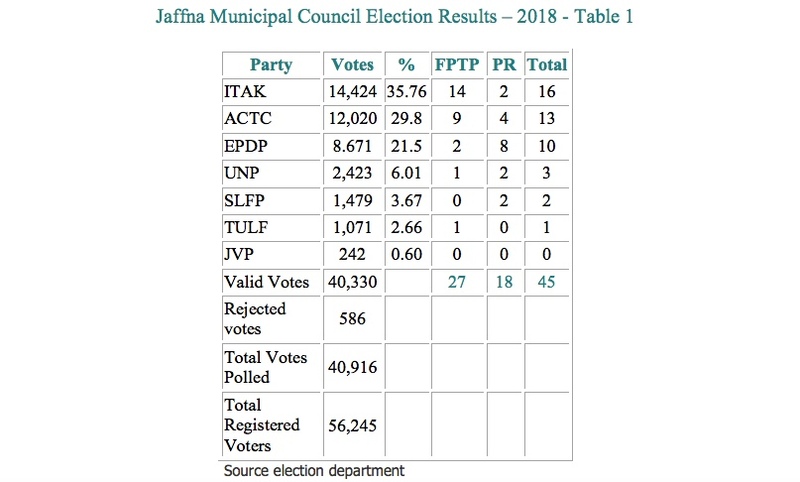 Election to LGAs is based on a 60% FPTP plus 40% on PR system, For example the Jaffna Municipal Council (JMC) has 45 seats out of which 27 seats (60%) will be elected on FPTP and 18 seats (40%) on PR. The elections resulted in ITAK winning 14 out of 27 seats ward-wise. The percentage of votes polled by ITAK is 35.76% and, therefore, it is entitled to 16 seats. Under the FPTP the ITAK/TNA won in 14 wards out of 27 wards. Therefore, it will be allocated 2 more seats (16-14) taking the total to 16.What if ITAK won 17 wards out of 27 wards. It will be allowed to keep the 17 seats, but no seats from the PR list. This system favours small parties at the expense of bigger parties. For example, ACTC won 9 wards out of 27 and polled 29.8% of the total votes and, therefore. entitled to 13 seats. Since it won only 9 wards on FPTP it is entitled to another 4 on the PR making the total 13 members. So under the present system a party that wins more seats on the FPTP will get lesser or no seats at all under the PR list! For example, a Party that comes fourth with 10% of the total vote but no elected seats may get as many as 3, 4 or even 5 seats under the new system! Here is the Table 1 showing results of the JMC at the 2018 election. It will be observed that under MES the party with more seats under FPTP is penalised, the ITAK getting only 2 seats while the ACTC bags 4 seats under PR. The SLFP with just 1,479 votes gets 2 seats under the PR. Under the old PR system ITAK would have got two more bonus seats. This weighted representation to smaller parties will encourage many to contest elections as independents. It is, therefore, necessary to have a second look at the present system before elections are held for Provincial Elections to avoid hung councils. It is true that the SLPP has done well overall, but the vote percentage of SLPP is less than votes for the undivided UPFA in 2011. The following Table 2 is a comparison of election results in 2011 and 2018. 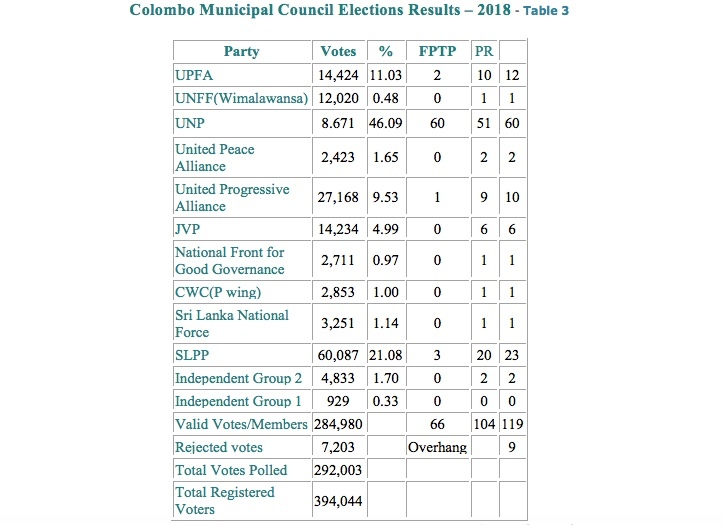 It shows the SLPP received only 44.69% of the votes in 2018 compared to 56.45% received by UPFA in 2011. The difference in percentage (11.76%) has gone to UPFA/ SLFP. These two parties managed to garner 13.38% of the traditional SLFP/UPFA vote bank. Though, the total votes polled by SLPP and the number of councillors elected under MES are very impressive, the UNP has come a close second. The difference between votes/percentage polled by UNP and LSLLP is only 1,343,162 (12.07%). If one adds the anti -SLPP votes polled by the UPFA/SLFP (Sirisena) then there is no difference in votes/percentage. I am emphasising these facts, since analysts are describing the SLPP’s strong showing as a landslide victory. Of course the bulk of the rural Sinhala-Buddhist voters are still with Mahinda Rajapaksa while somewhat secular urban voters are with Ranil Wickremesinghe. The UNP scored an outright win in the Colombo Municipal elections scoring 60 out of 110 seats with 46.09% votes. Though the UNP is entitled to only 51 seats, because it won 60 under the FPTP the party is allowed to keep all the 60 seats. As said earlier this unprecedented electoral pattern has resulted in hung LGAs across the country for the first time in the country’s history. The Local Authorities Elections (Amendment) Act No. 22 of 2012 Section 66B, decrees that any recognised political party or independent group which has obtained 50 percent or more of the total number of seats in local authority, the Commissioner will call upon its Secretary or leader to declare who the Mayor and Deputy Mayor of the LGA. When the first meeting of the LGA’s meet on 6 March, 2018. parties would have to show a clear majority to the Provincial Commissioner in order to appoint a Mayor, Deputy Mayor or Chairman. The election campaign was concluded on 7 February, 2018. The major issues on which there was heated debate among party leaders centred around the Central Bank Bond scam, the Constitutional Proposals by the Steering Committee, the corruption in high places, failure to fulfill promises made to people, debt burden, stagnant economy etc. Another factor that contributed to the defeat was the fierce infighting and mudslinging between the two coalition partners. Instead of mounting an all out campaign against SLPP, President Sirisena was sniping at UNP Ministers and parliamentarians. More than Ranil it was Sirisena who lost his cool and behaved childishly. As a result the uneasy coalition between the UNP and UPFA/SLFP now faces a major internal crisis amid finger pointing for the humiliating defeat. 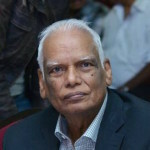 During the two-month long campaign, President Sirisena accused the UNP government of being more corrupt than the Rajapaksa regime they toppled together in January 2015. Obviously, Sirisena was referring to the Central Bank bond scam. They were also trading accusations as to who is shielding the Rajapaksas from arrest and prosecution in courts. At one stage President Sirisena who polled only 13.3 per cent votes, told the UNP that polled 32.6 per cent votes, their PM has to step down and someone else must takeover. President Sirisena was at odds with UNP’s foreign policy as well. He was un- happy about Sri Lanka co-sponsoring UNHRC Resolution No. 30/1 in 2015 that, inter-alia, called for the setting up of a hybrid Court composed of foreign judges to try violators of human rights, war crimes and crimes against humanity. President Sirisena swore and continues to swear he will not allow any war hero to be tried by foreign judges. President Sirisena, therefore, quietly engineered the ouster of Mangala Samaraweera from his foreign ministry portfolio. When the Foreign Ministry on the orders of Ranil Wickremesinghe interdicted Brigadier Priyanka Fernando, Defence attaché in Sri Lanka’s High Commission, for threatening to slit the throats of Tamil youths demonstrating against the government on 4 February, 2018 Sirisena swung into action to countermand the interdiction and reinstating Brigadier Priyanka Fernando. He thought his aggressive actions will result in more votes, unfortunately it didn’t. It only dented his image further as an incompetent and inefficient President! Consequent to the intensive shuttle diplomacy by foreign diplomats based in Colombo, notably India and USA, the coalition partners have agreed to produce a blue print that will allow the consensual government to continue to rule for the next 2 years. A cabinet sub committee with the participation of both sides is to be appointed while Ranil Wickremesinghe is to continue as P.M. This decision was taken on 13 th night. 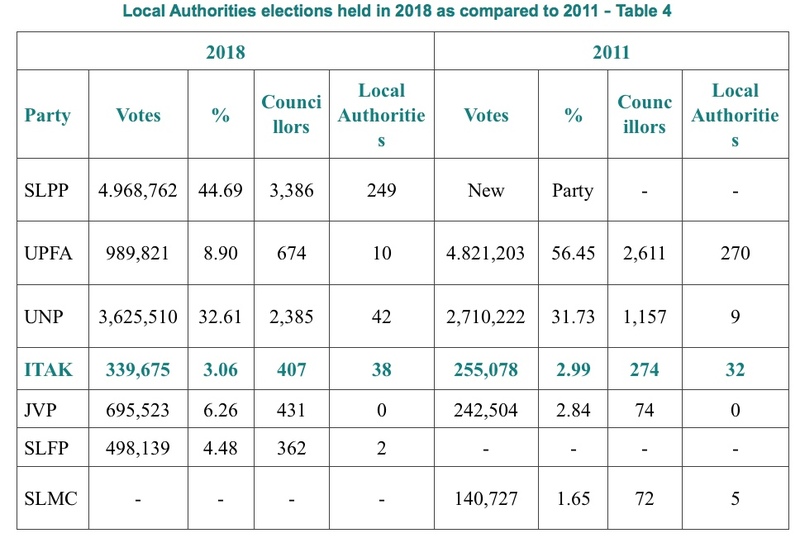 Coming to the local elections held in the North and East the following Table 4 shows the changes between elections held in 2011 and 2018. It will be seen that ITAK/TNA has increased its share by 84,597 votes and the number of Councillors elected by an increase of 130 members. The number of LGAs won has only marginally increased by six. However, compared to the Parliamentary elections held in August, 2015 the ITAK/ TNA have lost ground. In 2015 the ITAK/TNA polled 515,963 votes compared to only 339,675 votes in 2018, a decrease of 176,288 (52%) votes. There were/are several issues in which not enough progress on the ground after the end of the war 9 years ago. Over 50% of private lands owned by Tamil families are still in possession of the armed forces. The army is releasing lands, but the pace is extremely slow. Likewise in regard to missing persons only now the government has appointed commissioners and opened offices. It has voted Rs.1, 000 million towards the cost of operations. Though space has been created for free movement of people, free speech, media freedom etc. the government has failed to address the grounding poverty among war widows, ex LTTE cadres, unemployment among educated youth etc. Even in regard to the constitutional process, the government is not showing enough interest in enacting a constitution that will at least satisfy the aspirations of the Tamil people. Mahinda Rajapaksa is dead opposed to even the modest sharing of power that will go a long way to solve the festering ethnic problem. Tamils have to work with this government since the alternative is many times worse. After a week of political turmoil and uncertainty comes the news that both the UPFA/SLFP under President Maithripala Sirisena and the UNP under Prime Minister wickremesinghe have agreed to continue the Unity government for the next 2 1/2 years. It is imperative the two leaders should work together to keep their promise of good governance by eliminating corruption, waste, fraud and abuse of power. They should not fail the people and the country. Simple. “Yahapalanaya” claimed MR regime had stolen billions of dollars in their 10 year rule. I think it was Mangala Samaraweera who put the value at USD 18 billion. Ok, fine. Show us where the money is and show how you can recover them. The majority of Sinhala-Buddhists absolutely hate RW. They see him as well and CBK and many others especially in the UNP as well as lefitists like Dr. Wikramabahu K as Anti-Sinhala-Buddhist. All of you are in denial if you think otherwise. One critical way “Yahapalanaya” can keep the Sinhala-Buddhist vote spilt (below the 72 percent threshold) is to improve the economy and living conditions. But that takes time. They can however show us how to recover or atleast forensically show where the lost money is. This will put the corruption spotlight back on MR. “Yahapalanaya” wasted 3-years without effectively tackling this. Word of caution though, just because you locate stolen funds does not mean those foriegn banks will happily give them away. “Yahapalanaya” will be tempted throw MR and GR in jail but make no mistake a far more radical candidate will take their place. There are a lot of ex-military people who are willing to step in. Again, I will repeat this and I will repeat this a thousand times to you, you have to keep tthe Sinhala-Buddhist vote for MR or his proxies below the 70 percent. If it goes over 72 percents, it is game over for everyone else. “Yahapalanaya” needs younger newer faces. RW, CBK, Rajitha, Wikramabahu , those clowns at Puravesi Balaya and many many more have become toxic. Just showing their faces make “Yahapalanaya” lose votes. Reform the “Yahapalanaya” movement and put the corruption spotlight back on MR. Otherrwise we are all doomed. Call for general election. So this mess up will be over .. They never failed the people, who votes for them, the Sinhala mass. Lankawe is no longer a developing country. But North East is poorest in the region. There is no point in mentioning because it is absolutely beyond guaranteed that they will fail in every aspect the promises they gave to TNA. Probably even TNA may know that, but leaders don’t want to expose it to media that may cause retaliation from TNA’s voters. Hose bolted the day unity government came in to power bit late now? Unfortunately politics has evolved in such a way that ‘leaders’ have to be always Sinhalese Buddhists’. The success or failure of leaders depends on how they maintain the language/religion-divide. They have to get rid of thinking Sinhala only or Sinhalese only in our country..
every one came from India …do not forget that..and so why discriminate ..is it because you are in the majority..
yes indeed ..but forget your majority position and work for the betterment of our country..
Outside people are laughing at us because of our stupid political moves putting the country down for personal benefits of filthy politicians ..We have to grow up, teach lessons to these greedy selfish political bastards …and put our country a head of all these Asian nations who over took us after British left us and gave freedom. We misused the freedom we got without shedding a drop of blood unlike Indians. They do not want any of your pittance but let them do their own business and look after themselves.. They are hard working and enterprising and can do well , develop things in the country..
Do not show your stupidity to the entire world what kind of animals you are..behave like human…. Lanka was spoiled by you, the majority, the Buddhist monks and the greedy politicians..
Let the people look after Buddhism and the governments must not get involved in supporting one religion just because it is the majority peoples ..